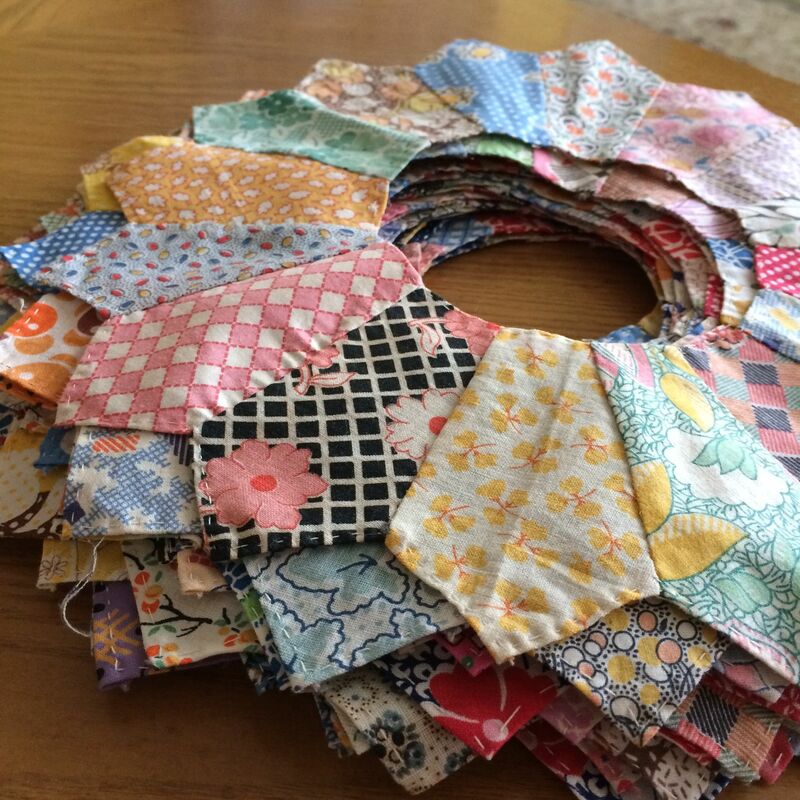 If you’ve been around awhile, you might have heard the first part of the quilt story: a local woman was cleaning out her mother-in-law’s house, and found a treasure hiding in a dresser. No one knew anything about this stack of Dresden Plate blocks, they might have been made long ago by the mother-in-law, but she was gone and couldn’t be asked. 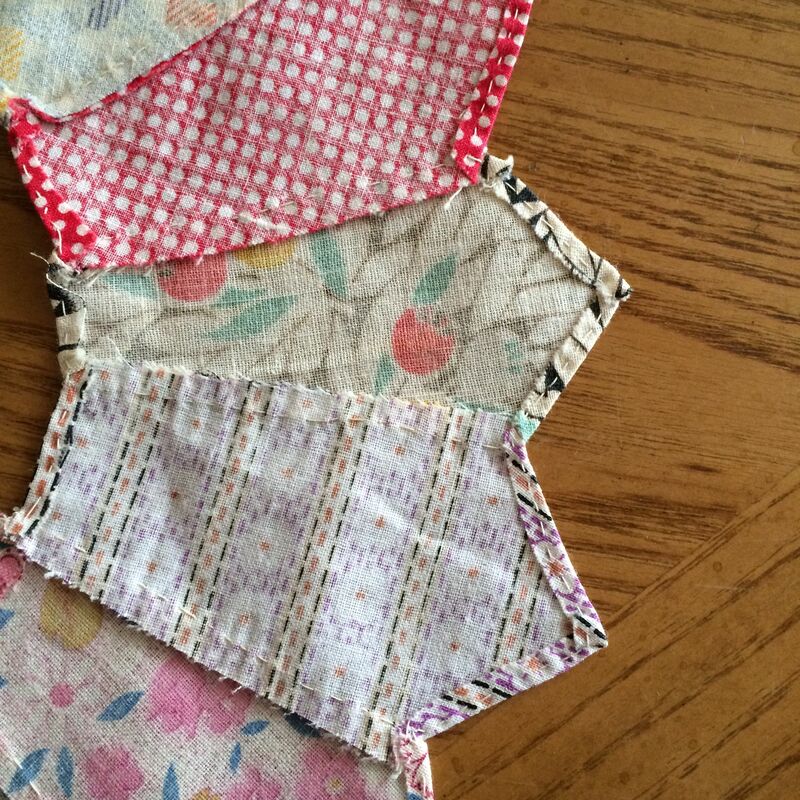 The woman that gave them to me wasn’t a quilter, and no one in her family was, either. 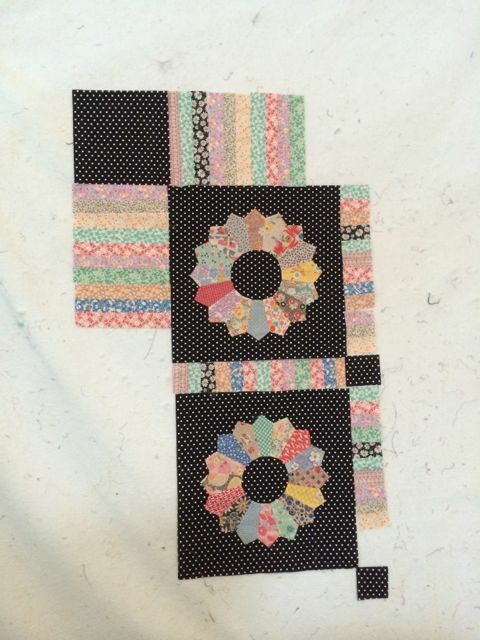 Keep in mind, this stack is what I still have left: there were 48 plates, and I’ve only just used 16 in this quilt, made one into a small wallhanging, and have machine appliquéd another in a test block. I have no plans, yet, for the rest of these. The plates are all hand-pieced and the edges were all turned and hand-basted in place. I love to hand-applique, but don’t love the prep work, so the fact that all of those edges were already turned and all I had to do was stitch was seriously awesome. Can you imagine, though, the woman that made these, and got them all the way to this point and then abandoned them to a drawer? I started hand-stitching these to squares of a black and white polka dot fabric, pulling them out every so often, getting one or two done before going back to other things. At some point, I also put out a call to online quilting friends, looking for repro 30s prints: I had a vision in my head, and needed some help with fabric acquisition, as I didn’t have any 30s prints in my own stash. I was very luckily gifted several stacks of fat quarters and yardage, and I hope that whoever it was that sent me the fabric will (a) forgive me and (b) speak up, because I very stupidly lost track of my generous benefactors. I also didn’t take any pictures of the stack, but you will soon see that I used nearly all of it in the resulting quilt. I will admit to being a little more enthusiastic than careful with my cutting and piecing of the border and sashing, so those are little bit wavy, but I know the quilter. 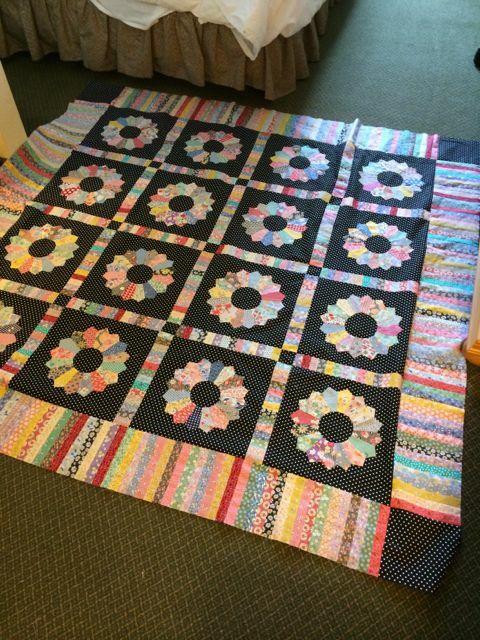 She can quilt that out…. We’re looking forward to seeing the finished quilt. It’s really charming.